Surah Al Fath - The Victory: Exegesis of 48th Chapter of the Holy Quran ~ Islam My Ultimate Decision . 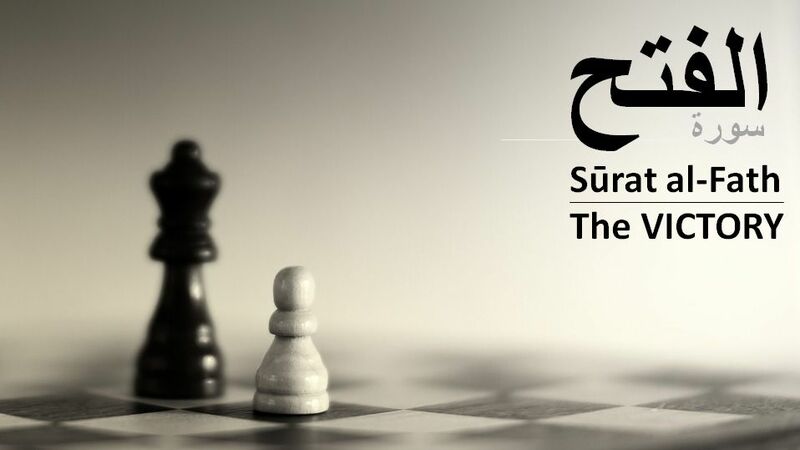 A detailed Overview and the circumstances after which this important surah was revealed has already been presented in one of our earlier posts, for it was necessary to understand the reference to the context to understand fully the why of revelation of this surah. 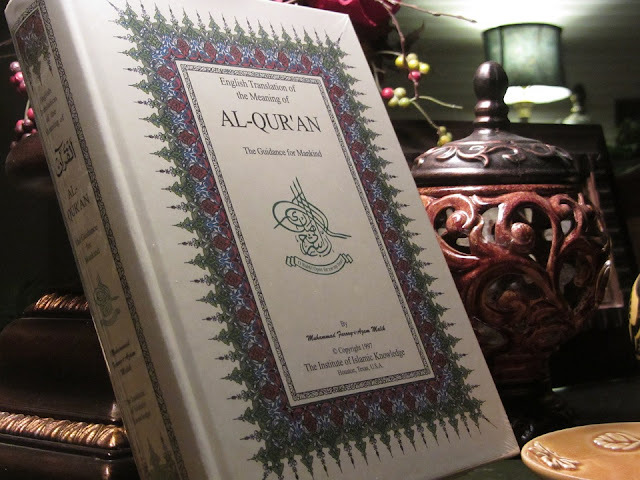 Today we in this post present the exegesis / tafsir of the surah verse by verse. Just to remind the readers, Surah Al Fath was revealed after the a peaceful treaty was concluded between the Muslims and the disbelievers of Makkah, known as the Treaty of Hudaybiyyah. It stipulated that : (1) War would remain suspended for ten years, and no party would indulge in any hostility, open or secret, against the other. (2) If any one during that period from among the Quraish went over to Muhammad, without his guardian's permission, he would return him to them, but if a Companion of Muhammad came over to the Quraish, they would not return him to him. (3) Every Arab tribe would have the option to join either side as its ally and enter the treaty. (4) Prophet Muhammad (peace be upon him) and his men would go back that year and could come the following year for Umrah and stay in Makkah for three days, provided that they brought only one sheathed sword each, and no other weapon of war. In those three days the Makkans would vacate the city for them (so that there was no chance of a clash), but they would not be allowed to take along any Makkan on return. Although the treaty was signed much to the satisfaction of the Prophet of Allah and many of his companions, some were apprehensive of the terms and conditions of the treaty and considered these unfavorable for the Muslims. The treaty was quite controversial initially for many reasons. Originally, the treaty referred to Muhammad as the Messenger of Allah, but this was unacceptable to the Quraish ambassador Suhayl ibn Amr. So the Prophet of Allah compromised, and asked Ali to strike out the wording. But Ali said, “I will not be the person to rub the words Muhammad, the messenger of Allah”. Upon this the Prophet of Allah asked him where were the words Muhammad, the messenger of Allah" were written for the Prophet of Allah was illiterate. When Ali pointed out to the words, the Prophet of Allah himself erased whatever followed after word Muhammad. The believers were also apprehensive of handing over two Muslims to Makkans as per the clause of the treaty. This in order to alleviate the apprehensions of those some that this Surah was revealed for ALLAH reserved the applause of ‘a great victory,’ not for any armed struggle, but for a peace treaty, which the common Muslim opinion held as acceptance of humiliating terms by the prophet and even considered it as a defeat. Nonetheless, the Prophet accepted the terms, and the treaty worked quickly and decisively to the advantage of the Muslim side. The freedom of any tribe to ally with either the Muslims or the Quraysh absolved the tribes of their former alliances, and some that had been allied with the Quraysh quickly switched to the Muslims. The concluding of a treaty with the Quraysh clearly demonstrated that the Muslims had acquired at least equal footing with the Quraysh, which was a feat in and of itself. Thus this treaty lays down an amazing emphasis on peace, dialogue and coexistence in Islam as opposed to armed struggle and war, even if defensive! 1. We have granted you a conspicuous victory. Upon its revelation, the Prophet of Allah remarked, 'Tonight there has been revealed to me a Surah which is dearer to me than that on which the sun shines (i.e. the world).' The fact that there was no actual ﬁghting at Hudaibiyah has led many to think that the words contain a prophecy about the conquest of Makkah, which, however, is referred to later on in the third section of this chapter. A very wrong thing has been uttered, it indeed is a great victory. You reached the very home of the polytheists, and they had to persuade you to go back by soliciting you to perform Umrah the following year. They themselves expressed the desire to suspend hostilities and have peace with you, whereas their malice and enmity against you is too well known. Allah has granted you the upper hand over them. Have you forgotten the day when you were fleeing from Uhud and I was calling you back from behind? Have you forgotten the day when the enemy had descended on us from every side in the battle of the Trench and the hearts were coming up to the throats? (Baihaqi on the authority of Urwah bin Zubair). In point of fact, that treaty was Mohammed’s masterpiece of diplomacy. It was a triumph. No one, except perhaps Soheil, had thought back as had Mohammed when the Quraishite stood before him. No one, except those two, recollected the beatings, the stoning, the escape by night, the hiding in the cave. No one thought of the hazardous exile with the seventy followers. The contrast between now and then was unbelievable, miraculous. That the Quraishites were willing to treat with Mohammed at all, to recognize him as someone worthy of their attention, to admit him as the ruler of an Arab community, was beyond the bounds of all expectations. But, apart from his personal triumph over men who had vowed to capture him, alive or dead, Prophet of Allah saw what no other Muslim did, the far‑reaching effects of the treaty. In fact what Prophet of Allah chiefly saw in having this peace treaty with Makkah was the effect it would produce on the local tribes. He was right in this too. Within a few days of signing the document which had caused so much stir among his own people, chiefs from all around were coming to swear allegiance. To understand the verse 2 below, one must keep the context in which this sentence occurs is kept in view, one will certainly feel that the faults referred to here imply those shortcomings and weaknesses that had remained in the struggle that the Muslims had been making for the success and victory of Islam, under the leadership of the Prophet (peace be upon him), for the past nineteen years or so. 2. That Allah may forgive you your sin, past and to come, and complete His favors upon you, and guide you in a straight path. 3. And help you with an unwavering support. 4. It is He who sent down tranquility into the hearts of the believers, to add faith to their faith. To Allah belong the legions of the heavens and the earth. Allah is Knowing and Wise. In verse 4 above, Sakinat in Arabic means calmness and tranquility and peace of mind. Here Allah calls its being sent into the hearts of the believers an important factor in the victory that Islam and the Muslims achieved at Hudaibiyah. From a study of the conditions of the time, one comes to know what kind of a Sakinat it was that was sent down into the hearts of the Muslims during that period and how it became a source of victory. If at the time when the Prophet (peace be upon him) expressed his intention to go for Umrah to Makkah, the Muslims had become terror-stricken and started behaving like the hypocrites as if they were going into the very jaws of death, or if at the time when they heard the news on the way that the disbelieving Quraish were coming out in great strength to fight them, they had been alarmed as to how they would face the enemy un-armed, and thus become panic-stricken. Then, if at the time when at Hudaibiyah the disbelievers had stopped the Muslims from going any further, and when they had tried to provoke them by launching against them repeated sudden attacks, and when the rumor of Uthman’s martyrdom had spread, and when Abu Jandal had appeared on the scene as the very image of oppression and persecution, the Muslims had actually become provoked and broken the discipline that the Prophet (peace be upon him) had instilled in them, the result would have been disastrous. Above all, if at the time when the Prophet (peace be upon him) was going to conclude the treaty on the conditions which were unacceptable to the entire party of the Muslims, the Muslims had happened to disobey him, the great victory of Hudaibiyah would have turned into a humiliating defeat. Thus, it was all because of Allah’s bounty that on all these critical moments the Muslims were blessed with full peace of mind with regard to the leadership and guidance of the Prophet (peace be upon him), the truth of Islam and the truthfulness of their mission. This is why they decided with a cool mind that they would face and accept whatever hardships they would encounter in the way of Allah. That is why they remained safe from fear, confusion, provocation and despair; that is why perfect discipline continues to prevail in the camp; and that is why, in spite of being deeply grieved at the conditions of peace, they submitted to the decision taken by the Prophet (peace be upon him). This was the sakinat that Allah had sent down into the hearts of the Muslims, and it was all because of this that the dangerous step of undertaking a journey for performing Umrah became the prelude to a unique victory. 5. He will admit the believers, male and female, into Gardens beneath which rivers flow, to abide therein forever, and He will remit their sins. That, with God, is a great triumph. In the Quran generally mention of the rewards for the believers is made collectively and separate mention is not made of the rewards for the men and the women. But here, since the general mention of giving the rewards could cause the doubt that this reward may perhaps be only meant for the men. Allah has made a separate mention of the believing women, saying that they too would be equal partners in this reward with the believing men. The reason is obvious. Those God-fearing women who encouraged their husbands, sons, brothers and fathers to proceed on the dangerous journey instead of stopping them from it and discouraging them by crying and wailing, and who did not even feel the alarm lest at the sudden departure of 1,400 of the companions the disbelievers and hypocrites of the surrounding areas would attack the city, should certainly have become equal partners with their men in the reward of jihad although they stayed behind in their homes. 6. (He also did this) to chastise the hypocrites, both men and women, and those who associate others in His Divinity, both men and women, and who harbour evil thoughts about Allah. They shall be afflicted with misfortune, Allah is wroth with them. He has laid His curse upon them and has prepared for them Hell. What an evil end! The hypocrites living in the suburbs of Madinah were thinking, as has been stated in (verse 12) below, that the Prophet (peace be upon him) and his companions would not return alive from that journey. As for the polytheists of Makkah and their pagan companions, they were thinking that they had successfully put to rout the Prophet (peace be upon him) and his companions by preventing them from performing Umrah. In fact, whatever these two groups had thought, they had this misunderstanding about Allah that He would not help His Messenger (peace be upon him). And in the conflict between the truth and falsehood, He would allow falsehood to defeat and frustrate the truth. And that they were encompassed by the same evil fate which they wanted to avoid and against which they had devised all those plans, and their same plans caused the evil fate to be hastened. 7. To Allah belong the legions of the heavens and the earth. Allah is Mighty and Wise. In verse 7, the theme of verse 4 has been reiterated for another object. There, the object was to state that Allah, instead of employing His supernatural hosts to fight the disbelievers, had employed the believers for it only because He willed to favor them. Here, the theme has been repeated to say that in order to punish the one whom Allah wills to punish He can employ whichever of His countless hosts He likes for the purpose; no one has the power to avert His punishment by his own plans. 8. (O Prophet) We sent you as a witness, and a bearer of good news, and a warner. Verbal evidence, i.e. the Prophet (peace be upon him) should bear out the truth of the realities and principles on which Allah’s religion is based and tell the world plainly that they are the truth and all that is opposed to them is falsehood. He should rise to proclaim without hesitation and fear the Being of Allah and His Unity, the existence of the angels, the coming down of revelation, the occurrence of life-after-death, the Hell and Heaven, all are realities, even if they appear strange to the world, and the people mock the one presenting them, or call him a madman. Likewise, the Prophet (peace be upon him) should openly present before the people the concepts, values, principles and rules pertaining to morality and civilization and social life that God has revealed to him, and reject as wrong all the concepts and ways which are prevalent and are opposed to them. Similarly, the Prophet (peace be upon him) should proclaim as lawful what is lawful in Allah’s law even if the whole world regards it as unlawful, and should proclaim as unlawful whatever is unlawful in Allah’s law even if the world regards it as lawful and pure. Practical evidence: That is, the Prophet (peace be upon him) in his own life should practically demonstrate all that he has been commissioned to present before the world. His life should be free from every shade of that which he calls evil, and his own character should clearly reflect that which he calls good; he should be the foremost in carrying out what he regards as obligatory, and most cautious in refraining from what he calls sinful. His own character and conduct should bear out how sincere and truthful he is in his invitation; and his own self should be such a model of his teaching that anyone who sees him should know what kind of a man he wants to produce by the faith to which he invites the world, what kind of a character he wants to instill in him and what system of life he wants to be established through him in the world. Evidence in the Hereafter: That is, when the court of Allah is established in the Hereafter, the Prophet (peace be upon him) should give evidence to prove that he had conveyed to the people the entire message, without making any alteration or changes in it, that had been entrusted to him, and that he had shown no slackness in making the truth manifest before them, by word and by deed. On the basis of this evidence, it will be determined what reward the believers deserve and what punishment the disbelievers deserve. From this one can have an idea of how great a responsibility had Allah placed upon the Prophet (peace be upon him) by raising him to the position of a “witness”, and how great should be the personality worthy of that high position. Evidently, there has been no slackness whatever on the part of the Prophet (peace be upon him) in the matter of giving evidence with regard to the faith, verbally as well as practically. That is why in the Hereafter, he will be able to testify that he had made the truth plain to the people, and that is how Allah’s argument will be established against them; otherwise, if, Allah forbid, there had been any slackness on the part of the Prophet (peace be upon him) in providing evidence, he could neither be a witness against them in the Hereafter nor could any case be established against the deniers of the truth. 9. That you may believe in Allah and His Messenger, and support Him, and honor Him, and praise Him morning and evening. The verses 10 and 18 describe the pledge that the believers took at the hand of the holy Prophet Muhammad, may peace be on him. This pledge has a special importance in the history of Islam and is known as ‘Bai’at-al-Rizwan’ (Covenant of the pleasure of Allah). Everyone of those who took the oath remained proud of it to the end of his days. 10. Those who pledge allegiance to you are pledging allegiance to Allah. The hand of Allah is over their hands. Whoever breaks his pledge breaks it to his own loss. And whoever fulfills his covenant with Allah, He will grant him a great reward. Some allies of the Makkans urged them to let the Muslims perform the Ummrah. “The Muslims are not asking for anything major, they only want to perform Umrah, let us not deprive them of this right,” the allies advised. But, their admonition fell on deaf ears. Seeing such adamant behavior, the tribal allies were fed up with the Makkans. They said that the Makkans did not want peace and they threatened to dissociate themselves from the Makkans. This softened the Makkan’s attitude. On learning about these developments, the Holy Prophet decided to send another emissary, to the Makkans, to directly put across to them his peaceful intentions. To ensure the security of the emissary he wanted to send someone who would be well connected in Makkah. He chose Hazrat Uthman (later the third Caliph of Islam). Since Uthman belonged to a resourceful family of Makkah, it was hoped that his position would shield him from any danger that propped up. The Holy Prophet also gave a letter to him for the Quraish. He also instructed him to try to contact the poor Muslims left behind in Makkah, in order to reassure them that Allah would soon open some way for them and that they should continue to be patient and steadfast. Hazrat Uthman received protection from his relatives and conveyed the message to the Quraish. The Quraish received the message and because of Hazrat Uthman’s ties with some of the influential people they offered him to perform the circuit if he so willed. But, the faithful Hazrat Uthman declined, “No, thank you, I will not perform the circuit unless it is in company of my master”. Hazrat Uthman repeatedly tried to persuade the Makkan leaders to pay heed to the Holy Prophet’s suggestions. But, the Makkans were insistent that they will not let Muslim’s perform circuit this year. So Hazrat Uthman finally decided to return, at that point a section of the Quraishites decided to detain him, in order to negotiate better terms from the Muslims. Meanwhile, rumor spread in the Muslim camp that he had been murdered. Anxiety and alarm spread through out the camp. The Holy Prophet himself began to suspect deceit. He assembled the companions and addressed them very passionately, “The life of an envoy is held sacred among all nations. I have heard that the Makkans have murdered Uthman. If this be true, then equitable retaliation in the matter of the slain is prescribed for us. We will undertake that no matter what the consequences are.” The companions were hearing him spell bound, the Holy Prophet continued: “Those of you who will solemnly promise that if they have to go further, they will not turn back except as victors, should come forth to take a pledge on my hand.” The Holy Prophet had hardly finished speaking when all companions rushed forward enthusiastically to take the pledge. All those who could fit in close to the Holy Prophet put their hands together and the Holy Prophet put his right hand on top of them. Those who could not squeeze in close to the Holy Prophet put their hands on the shoulders of those ahead of them. When every body was assembled, the Holy Prophet put his left hand on other hands and said: “This is for Uthman, for if he had been here, he would not have hesitated in making this holy pact, but, he is busy with the work of Allah and His messenger.” Of the fifteen hundred present that day all took the pledge except one hypocrite who held back. They all sedately promised that if the Muslim envoy had been murdered, they would not go back. They would either take Makkah by dusk or they would all die fighting. As on this occasion it was not yet certain whether Uthman actually had been killed or was still living, the Prophet (peace be upon him) placed one of his own hands on the other and pledged allegiance on his behalf, and thus bestowed a unique honor on Uthman in that he made Uthman a partner in the pledge by making his own sacred hand represent the hand of Uthman. The Prophet’s (peace be upon him) taking the pledge of allegiance on his behalf necessarily meant that he had full confidence that if Uthman had been present he would certainly have pledged the allegiance. That is, the hand on which the Muslims were swearing allegiance was not the hand of the Prophet’s (peace be upon him) person but of Allah’s representative, and this allegiance was in fact being sworn to Allah through His Messenger. 11. The Desert-Arabs who remained behind will say to you, “Our belongings and our families have preoccupied us, so ask forgiveness for us.” They say with their tongues what is not in their hearts. Say, “Who can avail you anything against Allah, if He desires loss for you, or desires gain for you?” In fact, God is Informed of what you do. In verse 11, people living in the suburbs of Al- Madinah have been referred to whom the Prophet (peace be upon him) had invited to accompany him in his march out for Umrah, but they had not left their homes in spite of their claim to faith just because they were afraid of death. Traditions show that these were the people of the tribes of Aslam, Muzainah, Juhainah, Ghifar, Ashja, Dil and others. The verse sums up in saying that Allah’s decision will be on the basis of the knowledge that He has about the reality of your actions. If your actions deserve the punishment and I pray for your forgiveness, my prayer will not save you from Allah’s punishment. And if your actions do not deserve the punishment, and I do not pray for your forgiveness, my failure to pray will not do any harm to you. Everything is in Allah’s control, not mine, and no one’s empty words can deceive Him. Therefore, even if I accept as true what you say and then also pray for your forgiveness on its basis, it will be vain and without result. 12. But you thought that the Messenger and the believers will never return to their families, and this seemed fine to your hearts; and you harbored evil thoughts, and were uncivilized people. That is, you were delighted to think that you had saved yourselves from the danger into which the Messenger (peace be upon him) and his believing supporters were going. You thought you had done so by dint of your great wisdom; and you also did not feel any compunction in rejoicing at the thought that the Messenger (peace be upon him) and the believers would not return alive from their expedition. You did not feel uneasy in spite of your claim to the faith but were pleased to think that you did not put yourselves in the danger by accompanying the Messenger (peace be upon him). 13. He who does not believe in God and His Messenger, We have prepared for the disbelievers a Blazing Fire. 14. To God belongs the kingdom of the heavens and the earth. He forgives whomever He wills, and He punishes whomever He wills. God is Forgiving and Merciful. The mention of Allah’s being All-Forgiving and All- Merciful, after the foregoing warning, contains in it a subtle aspect of admonition. It means this: Even now if you give up your insincere attitude and way of life and adopt sincerity, you will find Allah All-Forgiving and All- Merciful. He will forgive you your previous shortcomings and will treat you according to the quality of your sincerity in the future. 15. Those who lagged behind will say when you depart to collect the gains, “Let us follow you.” They want to change the Word of Allah. Say, “You will not follow us; Allah has said so before.” Then they will say, “But you are jealous of us.” In fact, they understand only a little. That is, the time is approaching when these very people who were shirking accompanying you on the dangerous journey, would see you going on an expedition in which there would be the possibility of attaining easy victory and much booty. Then they would come running and request you to take them also along. Such a time came just three months after the truce of Hudaibiyah, when the Prophet (peace be upon him) marched to Khaiber and took it easily. At that time everyone could see that after the truce with the Quraish not only Khaiber but the Jewish settlements of Taima, Fadak, Wadi-al-Qura and also others from northern Arabia would not be able to withstand the might of the Muslims and would easily fall to the Islamic State. Therefore, Allah in these verses forewarned the Prophet (peace be upon him) that the opportunists of the suburbs of Al-Madinah would come up to take part in and receive their share when they would see easy victories being attained, and that he should tell them plainly: You will never be allowed to take part in these, because only those who had gone forth to offer their lives in the conflict at Hudaibiyah regardless of every danger would be entitled o them. The words “Thus did Allah say before” caused the people the misunderstanding that this refers to some other command bearing upon the same subject that might have been sent down before this verse, and since no such command is found in this Surah before this verse, they started looking for it at other places in the Quran till they found (verse 84 of Surah At-Taubah), in which this very subject has been dealt with for another occasion. But that verse, in fact, does not apply to this, for it was sent down in connection with the Battle of Tabuk, and its period of revelation is three years after the period of revelation of Surah Al-Fatah. The fact of the matter is that this verse refers to( verses 18-19) of this Surah itself, and Allah’s already having said this does not mean its having been said before this verse but its having been said to the laggards before this conversation. This conversation with the laggards about which advance instructions are being given to the Prophet (peace be upon him) was to take place at the time of the expedition to Khaiber, and this whole Surah, including (verses 18-19), had been sent down three months earlier on return from Hudaibiyah on the way. A careful study of the context shows that Allah here is giving this instruction to His Messenger: When after your return at Al-Madinah the laggards come to you with their excuses, you should give them this reply, and when they express their desire to accompany you in the expedition to Khaiber, you should tell them this. 16. Say to the Desert-Arabs who lagged behind, “You will be called against a people of great might; you will fight them, unless they submit. If you obey, God will give you a fine reward. But if you turn away, as you turned away before, He will punish you with a painful punishment.” 17. There is no blame on the blind, nor any blame on the lame, nor any blame on the sick. Whoever obeys God and His Messenger—He will admit him into gardens beneath which rivers flow; but whoever turns away—He will punish him with a painful punishment. Verse 17 above lays down the rule for people who are exempted from fighting when Muslim armies march out. That is, the one who has a genuine excuse for not joining jihad is not accountable, but if the able-bodied, strong people make excuses for not joining it, they cannot be regarded as sincere with regard to Allah and His religion, and they cannot be given the opportunity to take advantage of the gains as members of the Muslim community, but when time comes for making sacrifices for Islam, they should lag behind and seek the safety of their lives and properties. Here, one should know that two kinds of the people have been exempted from jihad duty by the Shariah: (1) Those who are not physically fit for jihad, e.g. young boys, women, the insane, the blind and such patients as cannot perform military duties, and such disabled people as cannot take part in war. (2) Those for whom it may be difficult to join jihad for other sound reasons, e.g. the slaves, or those persons who may be ready for jihad but may not afford weapons of war and other necessary equipment, or such debtors who may have to pay their debts at the earliest opportunity and the creditors may not be willing to allow them more time, or such people whose parents (or a parent) might be alive, who stand in need of the children’s help. In this regard, it should also be known that the children should not join jihad without the permission of their parents if they are Muslims, but if they (the parents) are non-Muslims, it is not permissible for a person to stay away from jihad in case they refuse permission. 18. Allah was pleased with the believers, when they pledged allegiance to you under the tree. He knew what was in their hearts, and sent down serenity upon them, and rewarded them with an imminent conquest. Verse 18 is regarding the Treaty of Hudaybiyyah. This is called Baiat Ridwan. For, Allah in this verse has given the good news that he became well pleased with those who on this dangerous occasion did not show the least hesitation in offering their lives for the cause of Islam and gave an express proof of their being true in their faith by taking the pledge on the hand of the Prophet (peace be upon him). The word sakinat has again been used here that means that state of the heart on whose strength a man throws himself into dangers with complete calm and peace of mind for the sake of a great objective and resolves without fear and consternation to undertake it regardless of the consequences. 19. And abundant gains for them to capture. God is Mighty and Wise. 20. Allah has promised you abundant gains, which you will capture. He has expedited this for you, and has restrained people’s hands from you; that it may be a sign to the believers, and that He may guide you on a straight path. The spoils referred to in verse 19 are in reference to the conquest of Khaiber and its rich spoils and this verse expressly points out that Allah had reserved this reward only for those people who had taken part in the Baiat Ridwan; apart from them no one else was entitled to take part in the victory and have a share in the spoils. That is why when the Prophet (peace be upon him) marched out to attack Khaiber in Safar, A.H. 7, he took only those people with him. The mention of instantly granted victory in verse 20 here implies the treaty of Hudaibiyah which has been described as a manifest victory in the beginning of the Surah. Restraining the hands of people from you in this verse means that Allah restrained the disbelieving Quraish from attacking you at Hudaibiyah although from all appearances they were in a much better position and yours was a much weaker side militarily. Furthermore, it also implies that no enemy power could muster courage to attack Al-Madinah in those days, whereas after the departure of 1,400 soldiers the Al-Madinah front had become very weak, and the Jews, the polytheists and hypocrites could take advantage of the situation. Sin to the believers means how Allah helps the one who remains steadfast on obedience to Allah and His Messenger and comes out to support and defend the truth and righteousness with his trust and faith in Allah. 21. And other things, of which you were incapable, but Allah has encompassed them. God is Capable of everything. Many scholars believe that most probably this is a reference to the conquest of Makkah. It seems to mean this: Though Makkah has not yet fallen to you, Allah has encircled it, and as a result of this victory at Hudaibiyah, it will also fall to you. 22. If those who disbelieve had fought you, they would have turned back and fled, then found neither protector nor helper. That is, Allah did not prevent fighting at Hudaibiyah because there was a possibility of your being defeated there, but there were other reasons for it, which are being stated in the following verses. Had that factor not been there and Allah had allowed the war to take place, the disbelievers would surely have been routed and Makkah would have fallen to you at that very time. 23. It is God’s pattern, ongoing since the past. You will never find any change in God’s pattern. 24. It is He who withheld their hands from you, and your hands from them, in the valley of Makkah, after giving you advantage over them. Allah is Observer of what you do. That is, Allah was seeing the sincerity and the selfless devotion with which you had become ready to lay down your lives in the cause of the true faith and were obeying the Prophet (peace be upon him) without asking any question. Allah was also seeing that the disbelievers were being unfair. The demand of this situation was that they should have been punished there and then through you, but in spite of that, Allah restrained your hands from them and their hands from you. That at that time there were quite a number of the Muslim men and women living in Makkah, who were either hiding their faith, or were being persecuted because of their faith as they had no means to emigrate. Had there been fighting and the Muslims had pushed back the disbelievers and entered Makkah, these Muslims would also have been killed in ignorance along with the disbelievers. This would not only have grieved the Muslims but the Arab polytheists also would have gotten an opportunity to say that the Muslims did not even spare their own brethren in faith during wartime. Therefore, Allah took pity on the helpless Muslims and averted the war in order to save the companions from grief and infamy. The other aspect of the expedience was that Allah did not will that Makkah should fall to the Muslims as a result of the defeat of the Quraish after a bloody clash but He willed that they should be encircled from all sides so that within two years or so they should become absolutely helpless and subdued without offering any resistance, and then the whole tribe should accept Islam and enter Allah’s mercy as it actually happened on the conquest of Makkah. Imam Malik says that in such a case fire should not be opened, and for this he cites this very verse as an argument. He contends that Allah prevented the war at Hudaibiyah only in order to save the Muslims. (Ibn al-Arabi, Ahkam al Quran). But this in fact is a weak argument. There is no word in the verse which may support the view that launching an attack on the enemy in this case is unlawful and forbidden. At the most what one can say on the basis of this verse is that the launching of an attack in such a case should be avoided in order to save the Muslims, provided that it does not put the disbelievers in an advantageous position against the Muslims militarily, or does not diminish the Muslims’ chances of gaining an upper hand in the conflict. Imam Abu Hanifah, Imam Abu Yusuf, Imam Zufar and Imam Muhammad say that it is lawful to open fire in such a case; so much so that even if the disbelievers use the children of the Muslims as a shield by putting them in the forefront, there is no harm in shooting at them, and it is not obligatory for the Muslims to expiate and pay any blood money for the Muslims thus killed, (Al-Jassas, Ahkam al- Quran; Imam Muhammad, Kitab as-Siyar). Imam Sufyan Thauri also in this case regards opening of the fire as lawful, but he says that although the Muslims will not pay the blood-money of the Muslims thus killed, it is obligatory for them to expiate the sin. (Al-Jassas, Ahkam al-Quran). Imam Auzai and Laith bin Saad say that if the disbelievers use the Muslims as a shield, fire should not be opened on them. Likewise, if it is known that in their warship our own prisoners also are on board, it should not be sunk. But if we attack a city of theirs and we know that there are also Muslims in the city, it is lawful to open fire on the city, for it is not certain that our shells will only hit the Muslims, and if a Muslim becomes a victim of this shelling, it will not be willful murder of a Muslim but an inadvertent accident. (Al-Jassas, Ahkam alQur an). Imam Shafei holds the view that in such a case if it is not inevitable to open fire. It is better to try to save the Muslims from destruction; although it is not unlawful to open fire in this case, it is undesirable. But if it is really necessary and it is feared that in case fire is not opened it will put the disbelievers in a better position militarily against the Muslims, it is lawful to resort to shelling, but even then every effort should be made to save the Muslims as far as possible. Furthermore, Imam Shafei also says that if during a conflict the disbelievers put a Muslim in front as a shield and a Muslim kills him, there can be two possible alternatives: either the killer knew that the murdered person was a Muslim, or he did not know that he was a Muslim. In the first case, he will be under obligation to pay compensation for manslaughter as well as do expiation; in the second case he will only do expiation. (Mughni alMuhtaj). 26. Those who disbelieved filled their hearts with rage—the rage of the days of ignorance. But God sent His serenity down upon His Messenger, and upon the believers, and imposed on them the words of righteousness—of which they were most worthy and deserving. God is aware of everything. This is the answer to the question that was constantly agitating the minds of the Muslims. They said: The Prophet (peace be upon him) had seen in his vision that he had entered the Masjid al-Haram and went around the Ka'bah in worship. Then how is it that they were returning without performing Umrah? In answer to this, although the Prophet (peace be upon him) had told them that in his vision he had not seen that they would perform the Umrah that very year, still there remained some suspicion in the hearts. Therefore, Allah Himself explained that it was He Who had shown the vision and it was a true vision and it would certainly be fulfilled. Here, about the words Insha-Allah (if Allah so wills), which Allah Himself has used with His promise, one can raise the objection that when Allah Himself is making this promise, what is the meaning of making it conditional upon His own willing it? The answer is: Here the words Insha- Allah have not been used in the sense that if Allah does not will, He will not fulfill His promise, but in fact these relate to the background in which this promise was made. The presumption on the basis of which the disbelievers of Makkah had played the drama of preventing the Muslims from Umrah was that only he whom they would allow would perform Umrah, and would perform it only when they would allow it. At this Allah has said: This depends on Our, not on their, will. The reason why Umrah has not been performed this year is not because the disbelievers of Makkah did not allow it to be performed, but because We did not will it to be performed. In the future Umrah will be performed if We will, no matter whether the disbelievers allow it or disallow it. Besides, these words also contain the meaning that the Muslims too, will perform Umrah not by their own power but because We would will that they should perform it. Otherwise, if We do not will, they do not possess any power to perform it by themselves. This promise was fulfilled in the following year in Dhil- Qadah A.H.7. This Umrah is well known in history as Umrah al-Qada. The words clearly point out that it is not obligatory to get the head shaved in Umrah and Hajj, but it is also right to get the hair cut short. However, it is better to have the head shaved, for Allah has mentioned it first and then mentioned having the hair cut short. 28. It is He who sent His Messenger with the guidance and the religion of truth, to make it prevail over all religions. Allah suffices as Witness. The reason why this thing has been mentioned here is that when at Hudaibiyah the peace treaty was going to be written down, the disbelievers had objected to the use of the words Rasul-Allah (Messenger of Allah) with the name of the Prophet (peace be upon him), and on their insistence the Prophet (peace be upon him) himself had removed these words from the document. At this Allah says: Our Messenger’s being a Messenger is a reality which remains unaffected whether someone believes in it or not. If some people do not believe in it, they may not, for Allah is enough for a witness over it. Their denial will not change the reality, but the guidance and the true faith which this Messenger (peace be upon him) has brought from Us, shall prevail over all religion, no matter how hard the deniers try to obstruct its progress. 29. Muhammad is the Messenger of Allah. Those with him are stern against the disbelievers, yet compassionate amongst themselves. You see them kneeling, prostrating, seeking blessings from Allah and approval. Their marks are on their faces from the effects of prostration. Such is their description in the Torah, and their description in the Gospel: like a plant that sprouts, becomes strong, grows thick, and rests on its stem, impressing the farmers. Through them He enrages the disbelievers. Allah has promised those among them who believe and do good deeds forgiveness and a great reward. The last verse is about the companions of the Prophet (peace be upon him) who described are as hard against the disbelievers: They are not such that the disbelievers may mould them as they like. They can neither be cowed nor purchased by any inducement. The disbelievers have no power to turn them away from the great objective for the sake of which they have joined and followed the Prophet (peace be upon him) even at the cost of their lives. And whatever their hardness and severity, it is only for the disbelievers, not for the believers. As regards the believers they are soft, merciful, affectionate, sympathetic and compassionate. Their unity of aim and object has produced in them love and harmony and complete accord among themselves. Here the marks on faces do not mean the mark that appears on the forehead of some people on account of prostrations, but it implies the marks and traces of the fear of God, munificence, nobility and goodness of manner that naturally appears on the face of a person on account of bowing down before God. Man’s face is an open book on the pages of which different states of a man’s self can be seen easily. A vain and arrogant person’s face is different from the face of a humble, modest and unassuming person; an immoral person’s face is clearly distinguished from the face of a righteous and well mannered person; and there is a marked difference between the facial appearance of a wicked man and of a noble and virtuous man. What Allah means to say is: The companions of Muhammad (peace be upon him) are such that one can recognize them on first sight to be the best of mankind, because their faces shine forth with the light of God worship and God consciousness. This is the same thing about which Imam Malik has said that when the armies of the companions entered Syria, the Syrian Christians remarked: These people possess the very same qualities and characteristics of the disciples of the Prophet Jesus Christ (peace be upon him). The allusion probably is to Deuteronomy, 33: 2-3, in which the Holy Prophet’s (peace be upon him) advent has been foretold and the word saints has been used for his companions. Apart from this, if some other quality of the companions has been mentioned in the Torah, it is not found in the existing, corrupted Torah. And he said, So is the kingdom of God, as if a man should cast seed into the ground: And should sleep, and rise night and day, and the seed should spring and grow up, he knoweth not how. For the earth bringeth forth fruit of herself; first the blade, then the ear, after that the full corn in the ear. But when the fruit is brought forth, immediately he putteth in the sickle, because the harvest is come. And he said, Where unto shall we liken the kingdom of God? Or with what comparison shall we compare it? It is like a grain of mustard seed, which, when it is sewn in the earth, is less than all the seeds that be in the earth. But when it is sown, it groweth up, and becometh greater than all herbs, and shouted out great branches; so that the fowls of the air may lodge under the shadow of it. The last portion of this sermon is also found in Matthew, 13: 31-32. A section of the Muslims translates this verse, thus: Allah has promised forgiveness and a great reward to those from among these people who have believed and done good works. Thus, they invent a way to vilify and slander the companions, and claim that according to this verse many people among the companions were not believers and righteous. But this commentary goes against verses 4, 5, 18 and 26 of this very Sarah, and does not even accord with the initial sentences of this verse itself. In verses 4-5, Allah has made mention of sending down sakinat (tranquility) and of effecting increase in the faith of all those companions who were present with the Prophet (peace be upon him) at Hudaibiyah, and given them without any exception the good news of admission into Paradise. In (verse 18), Allah has expressed His good pleasure for all those who took the pledge to the Prophet (peace be upon him), and in this also there is no exception. In (verse 26), Allah has also used the word muminin (believers) for all the companions, has mentioned of sending down His sakinat to them, and obliged them to be righteous and pious, for they were most worthy and deserving of all mankind. Here also, it was not said that the news was being given only abut those who were believers among them. Then also in the initial sentences of this verse itself the characteristics mentioned are of all those people who were with the Prophet Muhammad (peace be upon him). The words are to the effect that all the people who are with him have this quality and characteristic. After this, suddenly in the last sentence there could be no excuse to say that some of them were the believers and others were not. The understanding of this surah is important as it carries many lessons for the believers and their faith on Allah. Doubting what has been sent on the Prophet of Allah and seeing it in very instant or prevailing environment can be misleading for there is nothing from Allah that can be misleading or fruitless for the believers. So be a believer with strong conviction and do not waver in the face of any advantage going to the disbelievers for at the end the believers will prevail and be rewarded for their steadfastness, reverencer and faith in Allah.